Professional contractors know how to make sure their operations are successful when cold weather arrives. They ensure quality continues. In the context of this article, quality will refer to the optimum degree of compaction achieved behind the paver. 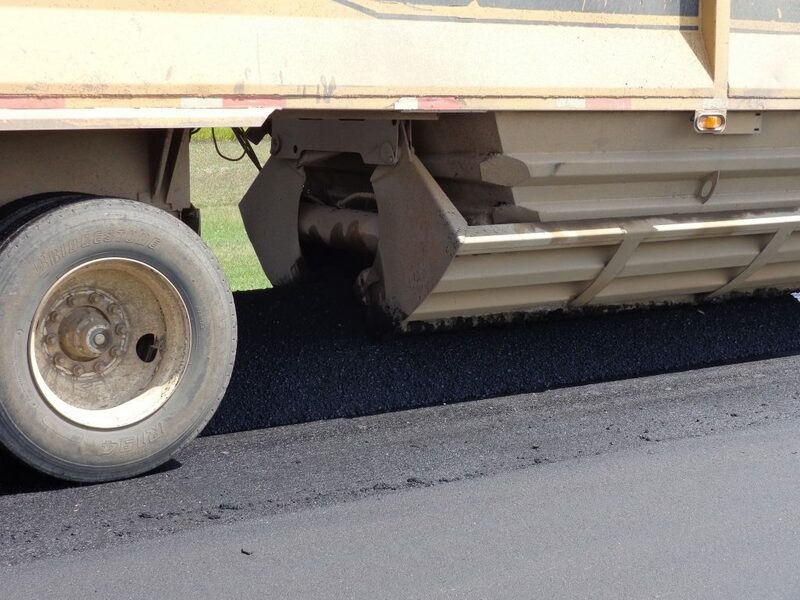 It is generally recognized that effective compaction is a critical variable in placing a quality asphalt pavement that will perform well for many years. Field experience confirms that paving can be done under adverse weather conditions; however, the key to success is recognizing which paving practices are best in the warm summer months and which are best during October through April. 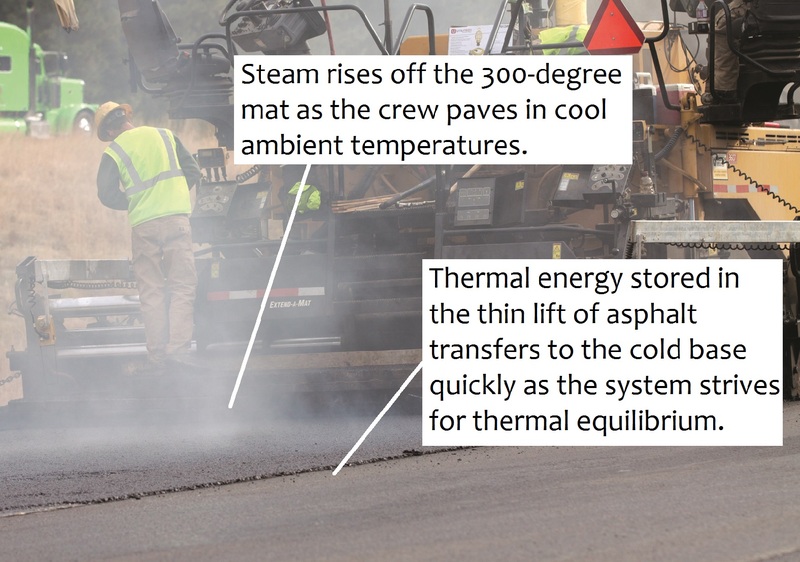 The temperature of hot-mix asphalt (HMA) during breakdown, intermediate and finish rolling will determine how successful the compaction operation will be. It is important to have an understanding of how mix temperature is related to the compaction of HMA. We know HMA is composed of aggregate and liquid asphalt cement (AC). For the concepts in this article, it’s important to remember that the AC binder has different viscous behavior at different temperatures. At low temperatures, AC will be highly viscous. This means it is “thick,” or slow moving. At high temperatures, AC will be less viscous. This means it flows more easily at higher temperatures. 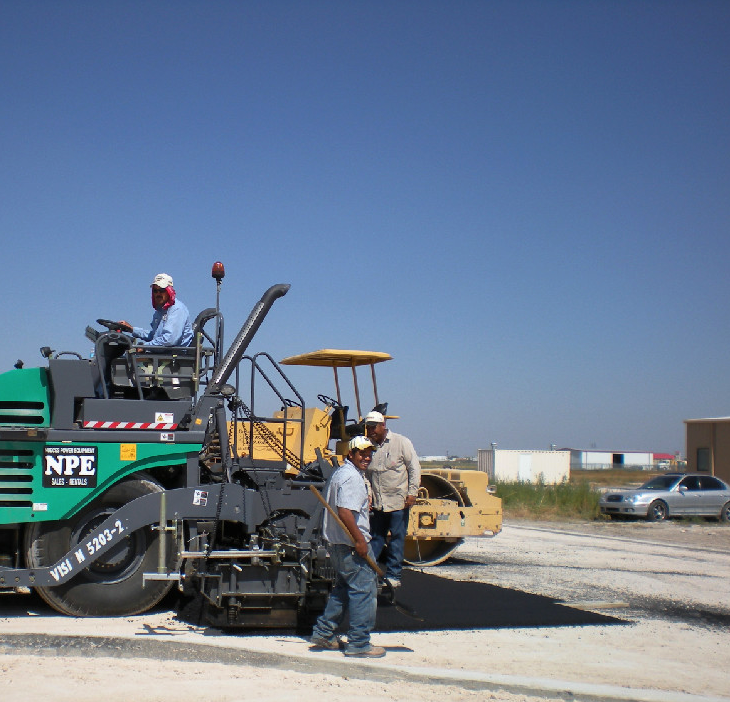 For paving applications, it is critical that the crew maintain the optimum mix temperature from the plant, through the paver, to the rollers. This is especially challenging in cold weather. As long as the AC binder within the mix is viscous enough to “flow,” the compactive effort of the rollers can force the mix into a compacted, stable configuration with good aggregate interlock. As the temperature of the mix drops, the AC within it becomes more viscous and more glue-like. When the AC hardens, the aggregate in the hot mix cannot be manipulated into a dense configuration by the force of the rollers. 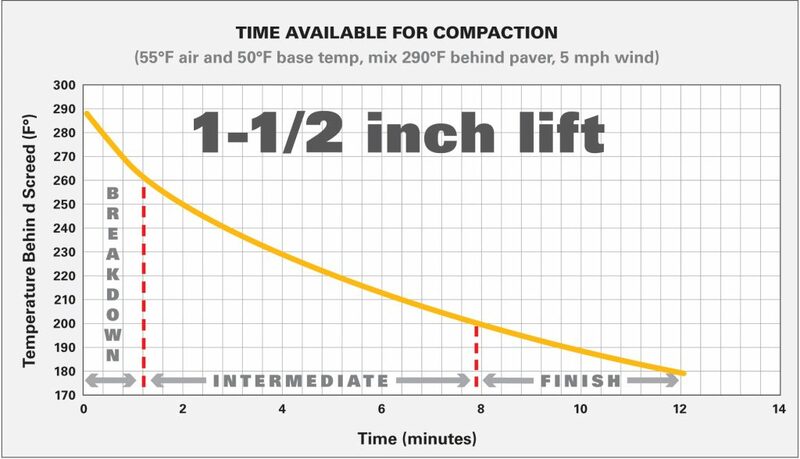 The time available for compaction is defined by the total amount of time that it takes for the mat to lose so much heat that it is too stiff to compact. The following list summarizes the primary factors influencing the rate of heat loss in HMA. Thicker lifts hold temperature longer than thinner lifts. The heat retained in asphalt lifts is not a linear relationship, but rather an exponential one. 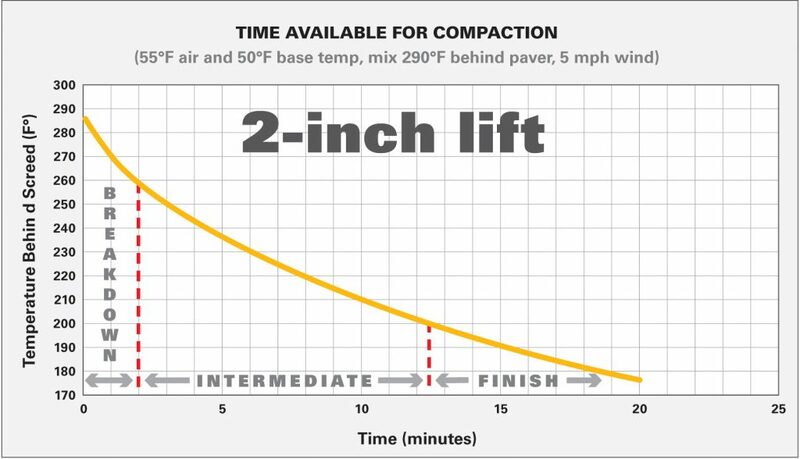 For example, a 3-inch (75-mm) lift will retain heat for approximately four times as long as a 1.5-inch (40-mm) lift of the same mix placed under the same conditions (See Figure 1). Base temperature also plays a significant role in how much time is available for compaction. This is especially true for thin lifts in cool weather. Heat transfer generally occurs more quickly through more dense media. For example, a glass of water will freeze much more quickly when placed in contact with ice in a bucket than when set on the middle shelf of a freezer with only cold air around it. The base material on which the asphalt is placed is essentially an infinite mass when compared to the thin lift of HMA on top. The base will absorb large quantities of heat very quickly. Laws of heat transfer tell us that when two surfaces of different temperatures are in contact, the resulting system will tend toward reaching a state of thermal equilibrium. That’s when both materials in contact eventually reach the same temperature. This phenomenon is observed when hot asphalt is placed on a cold base. The heat, or thermal energy stored in the HMA, quickly transfers to the cold base as the system tends toward thermal equilibrium. A greater temperature differential between the two materials means that the rate of heat transfer will occur faster. For thin lifts, because there is relatively little mass of HMA, heat transfer from the asphalt mat to the base occurs quickly. Heat transfer is primarily a function of mass, temperature differential and thermal conductivity. Mix delivery temperatures are critical, as they provide a starting point for the cooling process after the HMA comes in contact with the base. Lower mix delivery temperatures mean it will take less time for the mix to cool. The ambient air temperature has a relatively minor influence on the cooling rate of HMA. However, if the ambient temperature is combined with wind, a condition of both conductive and convective heat transfer occurs. Heat is now being lost to the base through conduction and to the air through convection. The greater the wind speed, the more quickly it will remove heat from the HMA. Finally, solar-radiant flux refers to the effect of the sun on HMA temperatures. This effect is minor in most circumstances. Solar-radiant flux refers to the net heat loss from the pavement that is the difference between the heat absorbed by the pavement from the sun’s rays and the heat that radiates off the mat into the air. Simply stated, this means sunshine will help reduce the rate of cooling of the placed HMA. When placing HMA, ensure that the mix temperature is a minimum of 290oF (145oC) at mid-depth of the mat behind the screed when the compaction process begins. The ideal mix temperature will vary depending on the binder type used in the mix, lift thickness and the time available for compaction under given ambient conditions. Many charts and computer software tools are available for free to provide good estimates of the rate of HMA cooling. The most efficient breakdown rolling of HMA should begin at temperatures above 290oF (145oC). When breakdown rolling begins at temperatures lower than this, the risk of not achieving sufficient compaction is greatly increased. It is almost impossible to achieve maximum compaction if breakdown rolling is not started before the mix cools to 280oF (140oC) behind the screed. Understanding that compaction is directly related to the mix temperature, it is necessary to maintain an optimum mix temperature during production, transportation and placement of the hot-mix asphalt. Mix production temperatures can be increased within limits. AC can be damaged if the mix is too hot. During cold-weather paving, generally request that plants load trucks with mix temperatures up to 330°F (165oC) maximum, depending on haul distance and other factors that affect mix temperature at the jobsite. Communicate with the plant operator. Tarp loads when necessary. For short hauls, the crust that develops maintains internal heat and is readily re-mixed with hot asphalt upon unloading and transfer to and through the paver. If you have good communication with the plant and a high yield day ahead of you, unload the third and fourth trucks first, then the first and second trucks. The first couple of truckloads can sometimes be cooler from plant start up and/or the cooler cone of silos. Hotter mix will heat up the paver screed faster and avoid tearing the mat at the start of paving. Avoid using a pickup machine. Approximately 10 to 20°F heat is lost from the time of delivery to the charging of the hopper. End dumping into the hopper results in about 5°F heat loss. Another 10 to 20°F is lost from the hopper to behind the screed. When pickup machines must be used, avoid long windrows. Do not string out windrows until they are ready to be picked up. Keep the paver hopper near full when waiting 15 minutes or less for trucks. The mix will retain heat better in a large mass and keep the hopper hot. Communicate with the plant to ensure good truck spacing and minimal waiting periods. Remove cold chunks that form due to cold truck boxes, which is usually only a problem in the first round of trucks. If cold chunks are not removed or thoroughly broken up and remixed, they will not compact and will pop out of the mat prematurely. Keep handwork and raking to a minimum. Every time the mix is “fluffed,” it loses considerable heat. Longitudinal joints require particular attention in cold weather. Roll from the hot side as soon as possible. Rubber tire rollers are more effective in kneading the cool surface of the mix together to reduce permeability. Can we reasonably expect to roll this mix before it cools too much? Do we need more rollers, or a wider roller to get coverage faster? Based on the job conditions of lift thickness and expected air and base temperatures, what will be our time available for compaction? Use charts, past experience or software programs to estimate a starting point. Always verify results in the field by measuring temperatures. What mix temperature should we ask the production facility to load trucks? Do we need to tarp trucks? How should we modify our rolling pattern based on the expected cooling rate? How much do we need to shorten the length of roller passes to cover the mat before it cools? 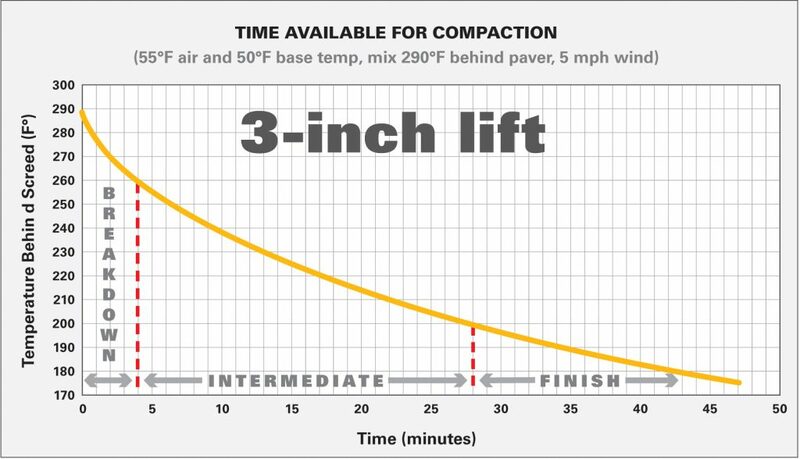 At what speed should the paver lay the mat so the compaction train can keep up without overcompacting? There are many questions to ask and variables to consider to be successful in cold weather paving. Know that mix temperature is critical to achieving compaction. Know that you will have less time to compact the mix in cold weather, as the mix will cool more quickly. Understand the factors that affect the cooling rate of the mix. Decide what variables you are willing and able to control, such as type of equipment used and requested mix delivery temperature. Take time to develop and review a cold weather paving plan with your crew and enjoy the success that comes with working as a team and taking pride in your work. This phenomenon is observed when hot asphalt is placed on a cold base. The heat, or thermal energy stored in the HMA, quickly transfers to the cold base as the system tends toward thermal equilibrium. Photo courtesy of Caterpillar Inc.
Be aware that different methods of mix delivery affect mix temperature changes and how quickly changes take place. Photo courtesy of Top Quality Paving. Another way to keep material temperature up is to pre-heat all paving components before the first load arrives. Make sure the hopper, the conveyors, the auger box and especially the screed are hot and ready to move the mix through the paver smoothly. Photo courtesy of IROCK Crushers.